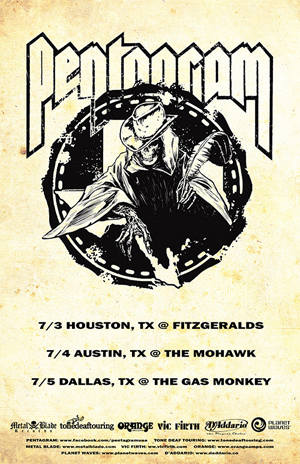 Doom legends PENTAGRAM will be performing select shows in Texas this July. The band will be appearing in Houston on July 3rd at Fitzgerald's, July 4th in Austin at The Mohawk, and Dallas on July 5th at The Gas Monkey. For more details and to keep track of future updates, visitfacebook.com/pentagramusa. PENTAGRAM's most recent album, Last Rites, was released via Metal Blade Records on April 14, 2011 and their first ever official DVD (also out on Metal Blade), When The Screams Come, on August 30, 2011. Both releases were met by rave reviews from fans and critics alike and saw the band playing sets at infamous SXSW festival in Austin TX as well as tours across the US and dates in Europe.